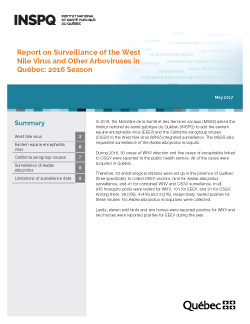 Therefore, 53 entomological stations were set up in the province of Québec: three specifically to collect EEEV vectors, nine for Aedes albopictus surveillance, and 41 for combined WNV and CSGV surveillance. In all, 935 mosquito pools were tested for WNV, 101 for EEEV, and 91 for CSGV. Among them, 28 (3%), 4 (4%) and 2 (2%), respectively, tested positive for these viruses. No Aedes albopictus mosquitoes were collected. Lastly, eleven wild birds and two horses were reported positive for WNV and two horses were reported positive for EEEV during the year.